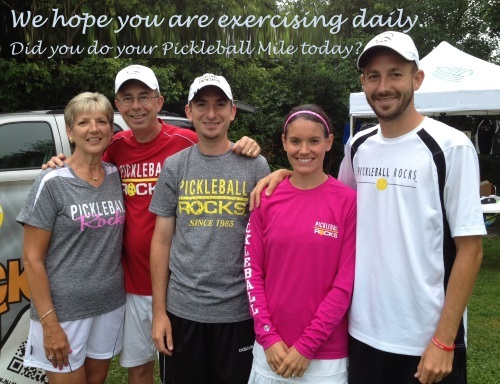 Did you do your PIckleball Mile today? Tell your fellow club members on Facebook. Playing pickleball for exercise and good health should be enough, but we decided to challenge you with some fun goals. When you sign up for the Pickelball Mile Club you will receive an email with a printable Pickleball Mile Tracking Sheet attached. Simply use this sheet to keep track of your Pickleball Miles. When you reach a milestone such as 100 Pickleball Miles or 250 Pickleball Miles or 500 Pickleball Miles, let us know by sending us a picture of your tracking sheet. (you can copy the tracking sheet as many times as you want). You will receive recognition on the Pickleball Mile Facebook page and you will receive an awesome reward for your efforts. 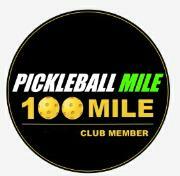 100 Pickleball Miles: You will receive a 100 Mile Club Member magnet.